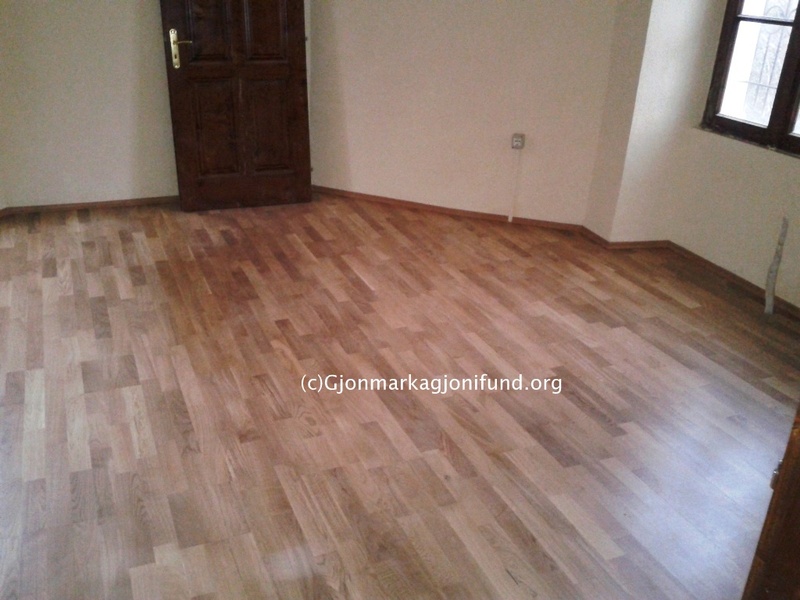 Our family home is located in the heart of the city of Shkoder, Albania. The home dates to the 16th c. and is decorated in the neo-Reneissence style, topped with a zig-zag roof. 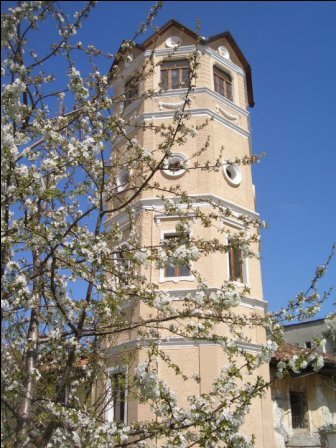 It houses Shkodra’s prettiest tower and is hidden and inaccessible behind the concrete wall. The tower is part of the medieval residence of the Gjon Markagjoni family and the tower was declared a cultural monument in 1973. The 100th Anniversary of the Independence of Albania brought restoration to part of the house and the famous tower belonging to the Markagjoni family in Shkodra. 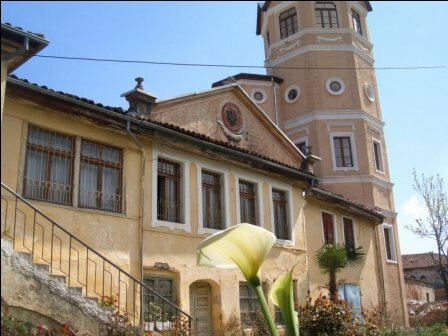 This house is more than two centuries old but the tower was erected later, c.1900’s and designed by noted Albanian architect Kole Idromeno (1860-1939). 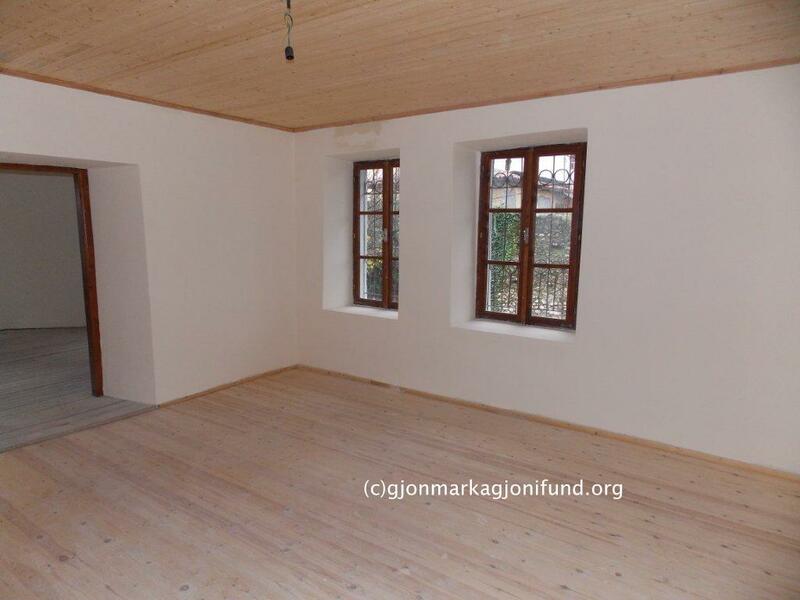 The house stands as evidence of the communist terror suffered by a family with anti-dictatorial principles. 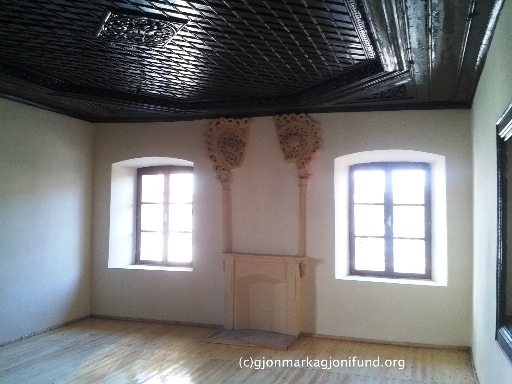 History shows the Gjomarkajs are a branch of the famous medieval Dukagjini and yet, because of that name, they suffered one the worse communist persecution. Upon the communist take over the house was confiscated by the regime and turned into a myriad of things from government offices to lastly a school for girls, with additional buildings erected on the property as offices. 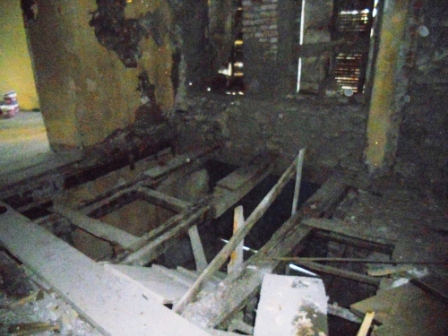 The house was unimaginably damaged over the years and prior to the fall of communism in 1991, the powers that be decided “if they couldn’t have it, nobody could” and proceeded to destroy it even more. 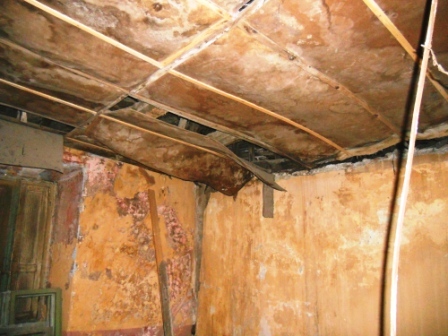 As these photos will show the house was left in an unlivable state. 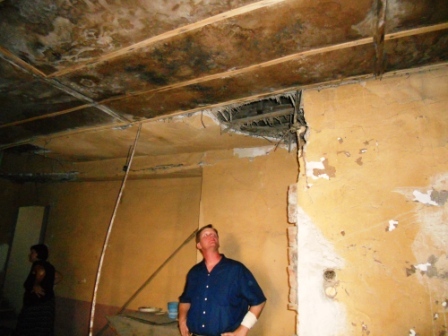 When my Uncle Deda and Aunts Marta and Bardha returned to the home in 1991, their spirit unbroken, they took it upon themselves to live in the house in deplorable conditions until such a time as they could afford to make some repairs. My cousin Gjon Mark Markagjoni, son of Kapidan Mark Gjon Markagjoni (Gjomarkaj), came to live with my uncle and aunts and over a period of 6-7 years restored part of the house. Sadly, Gjon passed away in 2003, leaving his uncle, aunts and sisters in a state of complete loss and sadness. Up until 2012 nothing else has been done to the house except for minor repairs. As you will see in the ensuing photographs, the exterior has been somewhat restored now. 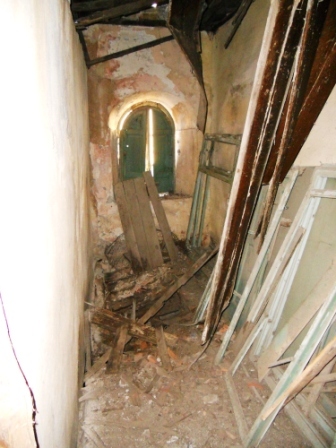 On the interior, three-quarters of the house was still in total disarray. 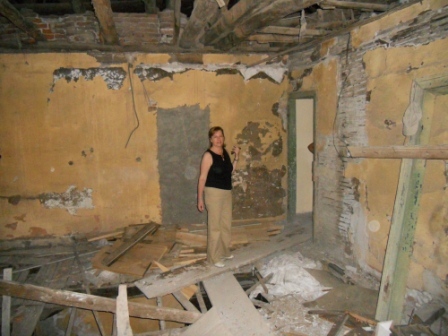 Remember…this is how the house was left by the regime and how the family lived in it while restoring portions of it. No running water, no electricity. 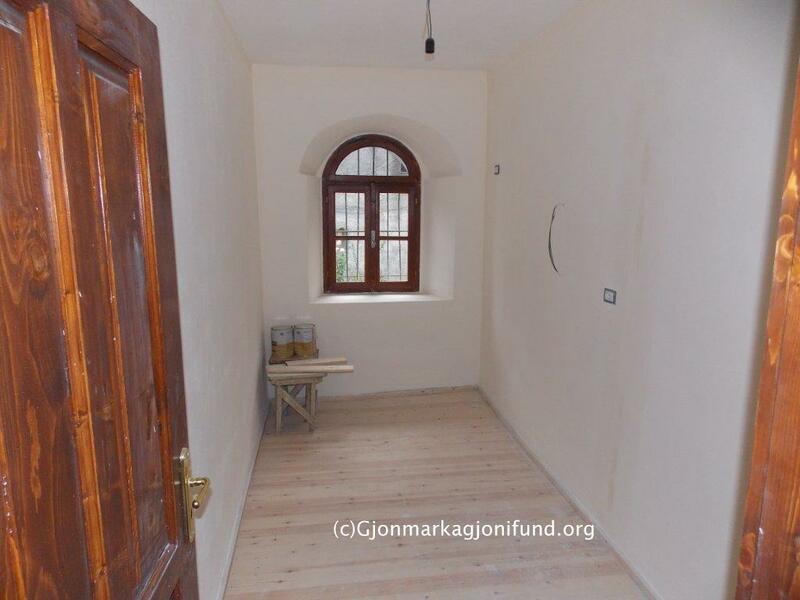 Since mine and my husband Vince’s arrival in Albania in November 2012, we have taken it upon ourselves to contribute what we could to the clean up, maintenance and upkeep of the property. To date we have done quite a bit. As you can see from these photos we have cleaned up the yard quite extensively. We rebuilt the one-story barrack that was at the entrance to the property and removed the remaining structures. As of today, October 10, 2017, the front has been totally restored through patience and hard word! The photos below will show the before and after. 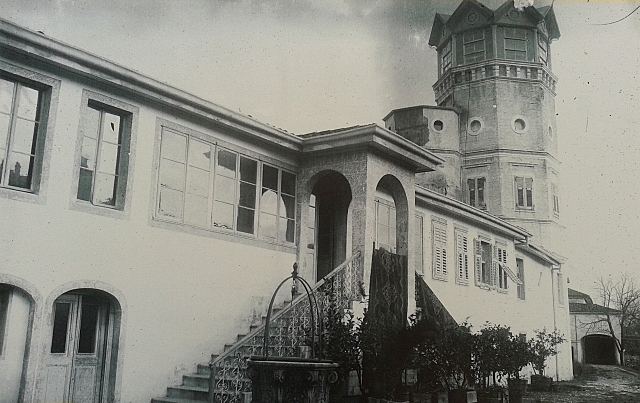 The government declared the Tower a Cultural Monument in 1973 did some renovation to the right wing of the house. 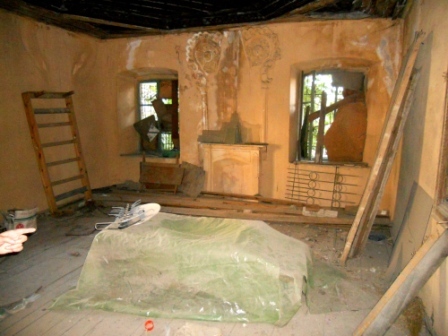 I say renovation because unfortunately it was not “historically” restored. The library (below) was the focus of the renovation. 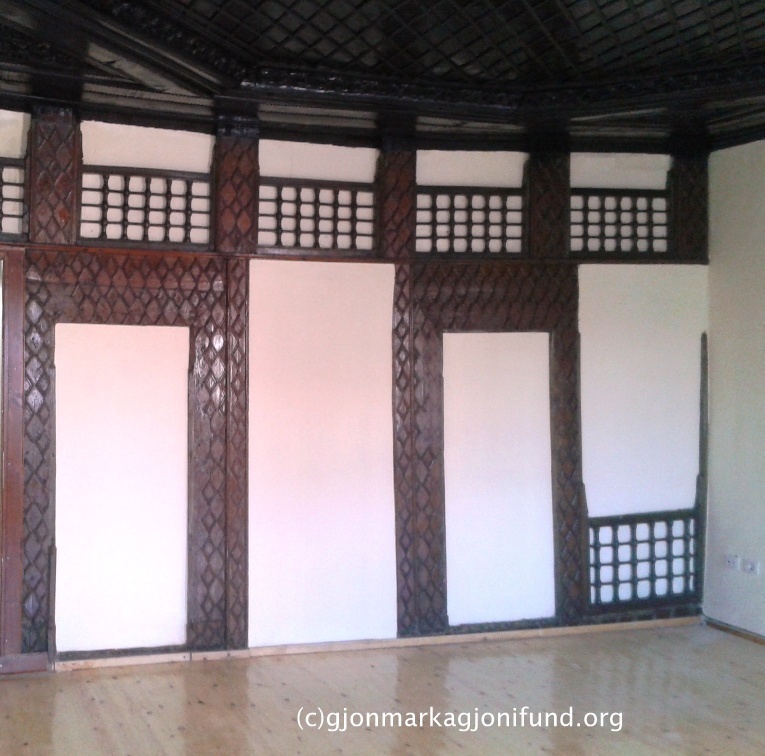 This was Gjon Markagjoni’s private library, where he conducted all his business.